Before we start, please ensure you have Python and ngrok installed. We will set up everything else as we go. In a different terminal window, let’s start ngrok. Ngrok will allow us to expose your localhost at port 5000 to incoming requests. We will be using this to allow Twilio to communicate with our local python server. It is important that you do not close this window, so please have two terminal windows open – one for python and the other for ngrok. Next, use the Twilio Console to acquire a Twilio number with calling and texting capability. We’ll use this as our event hotline. After all, we do want to talk to our attendee, despite not wanting to give them our private phone number. Did I say attendee? I meant attendees! We obviously want to talk to more than one of them. However, all messages routed through our proxy will show up on our phone as being from the proxy number. To not get confused about which attendee sent us what, we will have to come up with a way to know who each text is from. To know who sent a certain text, we will use a protocol-like formatting that allows us to see both, so Hello World! becomes +447987654321: Hello World!. Now we can use the above helper functions to integrate with Twilio. The code below will create the Flask app and set up the first endpoint. The Flask app is initialized in the first line and started in the last line with app.run(). In between, we add the /sms endpoint. Later in this section, we will configure our Twilio number to send a request to the /sms endpoint upon receiving a text message. This request contains the message body and the number of the sender. In our endpoint code, we store both in variables. We use the sender number to determine whether the sender number is ours or an attendee’s and execute the respective clause in the if-else-statement. If we are the sender, we expect the message body to be of the format +447987654321: Hello World!. In this case we decode the message body and then call the send_message. If the message comes from an attendee, it should be of the format Hello World!. We encode the message and send it to our number using the send_message function. The send_message function takes as input a message and the designated recipient’s number. After creating a MessagingResponse object, we create the response with the given message and number by calling the message method on the object. Afterwards, we return the response object to finish the request. If you have been following along and copying the code into your server.py file, you can now save it. Run this code by typing python server.py into your terminal (python3 server.py if you are using python3). Once the code is running your server will be live at the forwarding URL ngrok displayed in your other terminal window. 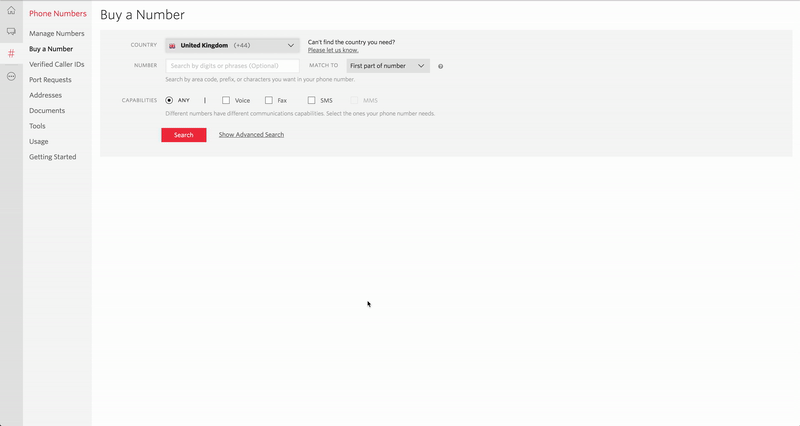 Copy your server’s URL, and navigate to the dashboard page for your Twilio phone number (you can find this by navigating to the phone numbers overview and then selecting your Twilio number). You should see a form that looks like the one below. We need to paste the Ngrok URL with /sms appended to the end into “Messaging” > “A Message Comes In” as a webhook. While you’re at it, you can work ahead and fill in “Voice & Fax” > “A Call Comes In” with the URL and /call. Twilio will now know to send an HTTP POST request to your webserver when your Twilio number gets a message which will hit the endpoint we created above. You’re now ready to text attendees through your proxy and receive replies. Try it by asking a friend to send a text message to the Twilio number! Alternatively, acquire another Twilio number and send a text message using this number. When your friend or your friendly second Twilio number sends a text to your Twilio proxy number, your normal number should receive an encoded message. Reply in the encoded format and see whether your friend gets your reply as well. If you sent the number with another Twilio number, you can see received messages in the console by navigating to “Messages Log” for your second Twilio number. Now that texting works, we’ve almost got a fully functional proxy number! The only thing left is to set up calling. Let’s start with forwarding calls made to our Twilio number. When a call is received by our Twilio number, Twilio will make a request to our server’s /call endpoint (as we configured above). We have to create a response that instructs Twilio to forward the call to our private number when we receive that request. TwiML is exactly such a response. TwiML is an XML encoded set of instructions that tell Twilio what to do when an incoming call (or SMS) is received. In our case we want to redirect a received call to our personal number. The snippet below does this using the TwiML verb . We pass two arguments: the number to which we want to forward the call and caller_id. Passing caller_id as None will allow us to see the original caller on our phone. When we are making a call, we will pass the TWILIO_NUMBER as the caller_id. Thus we can program it so that when an attendee is calling you can see their number, and when you call an attendee, they see your TWILIO_NUMBER. # Connect the dialed number to the incoming caller. Next, we’ll add two endpoints to our server: /call and /aliasing. A request to this endpoint will be made both when attendees call us as well as when we want to call attendees. Fortunately, when a request is received at this endpoint, the payload includes the number of the caller. The number of the caller will allow us to identify whether we are calling ourselves by checking whether the number is equal to our PRIVATE_NUMBER. If it’s not our number it is probably an attendee. In that case let’s simply pass the call on to the PRIVATE_NUMBER. If the number is our number we have some more work to do. The code below uses another TwiML verb, <Gather>, to deliver a warm welcome message asking us to dial the number of the person we wish to call, followed by the #-symbol. After we type in a number and press the #-symbol, the Gather implementation will perform the action that is specified when initializing the Gather object. In our case, it sends a request with the gathered data to the endpoint /aliasing. We will create the /aliasing endpoint in the next step. Within the aliasing endpoint, we will get the digits that we entered on the phone and perform a call to that number. In this case we will pass the TWILIO_NUMBER as the caller_id so that the person on the other end does not see our private number. Add the following right below the send_message function we just added. Restart your server and that’s it! Dial your Twilio number from a friend’s phone and it should forward the call to your phone. Then try calling your Twilio number from your personal number, and you’ll be prompted to input a number you’d like to call. Input your friend’s number and you’ll see your Twilio number showing up on your friend’s screen. You can see the complete project on GitHub. Go on and make as many numbers as you’d like! If you don’t need the number anymore or need to ghost, just delete the number from your Twilio account. If you’re interested in taking this project to the next level you could implement logic for a number that only redirects calls during work hours or even come up with semi-automated answers. To have this proxy number permanently running you will also want to move your project to a server instead of your local machine. If you have any questions feel free to reach out at @naomi_pen or find me at naomi.codes.